A beautifully written account, with interesting new interpretations for the expert as well as a wealth of information for the generalist. This is a very well balanced and informative book. Porter clearly admires Katherine, her intellect, her passion for learning, her ability to adapt to circumstances, but she does not allow Katherine's strong points to completely overshadow the less attractive elements of her character – her reluctance to pay her bills and her rather cynical manipulation of her step-son, Edward VI's, affections in her and Seymour's bid to have their marriage recognised, are noted.She also reads Katherine's very unkind letter to Lady Wriothesley on the death of the lady's child at face value and does not try to soften it. Porter's underlying theme seems to be that Katherine, like all good daughters of a Tudor family, was aiming for familial power: if possible, through a child of her own, and if not, through her influence over her step-children and the promotion of her relatives and servants. Porter gives a new interpretation of Katherine's relationship with her fourth husband, Thomas Seymour. Acknowledging it to be a love match, she also speculates on it as a considered and deliberate route for both to achieve their joint ambitions of control of the minority government of Edward VI. 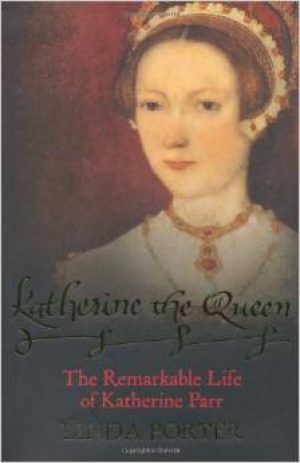 Katherine, disappointed of the Regency by Henry VIII's final Will, wanted to retain influence in the new regime, and a marriage to the new King's uncle would improve her ability to stay close to the King. Unfortunately, she appears to have reckoned without Seymour's poor judgement and the sibling rivalry between the Seymour brothers. As well as the wider issue of power politics and factionalism in the Tudor court, Porter concentrates on Katherine's journey from traditional faith to evangelism, and her strong influence over her step daughter, Elizabeth. Porter never goes beyond the facts. In the debate about whether Katherine served in the household of Mary Tudor in the period around and after the death of Lord Latimer, she clearly identifies that there is no record of Katherine in Mary's accounts as an official member of the Princess' household. The evidence of an order for dresses and jewellery for the Princess issued by Katherine to be paid for by the King's accounts department she accounts for as an activity that any of Mary's friends or subordinates might have carried out for her, especially as Mary and Katherine were both lovers of fine clothes and jewels. However, this faithfulness to what can be proven does not make for a dull book, because Porter uses her facts to draw interesting inferences and interpretations that are new. For example, the reconsideration of Katherine's physical relationship with Henry: the old Victorian idea that Katherine was merely his nurse has long been dismissed, but Porter argues for a determined effort by Katherine to keep the King sexually satisfied, citing the frequent purchases of perfumes, body lotions, flowers for her bedchamber and beautiful and sensual clothes as her efforts to keep him motivated. This book review is part of a Profile on Katherine Parr available for Kindle, for purchase from Amazon US and Amazon UK.